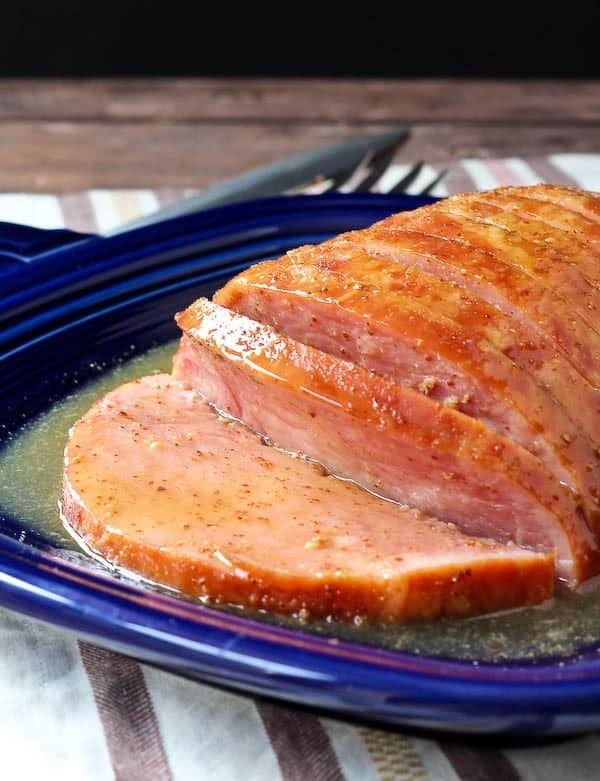 Whether you’re entertaining or just looking for an easy dinner with great leftovers – this 5 ingredient maple dijon ham is for you. Bonus: SLOW COOKER. Totally hands-off! This post is sponsored by the Ohio Soybean Council & Ohio Pork Council. You know what kind of meals I love? Five ingredient meals. Bonus points for the slow cooker. Spend ten minutes making this baby and you’re all set for dinner. You can spare ten minutes before you get the kids off to school – I know you can! E started Pre-K last week so I’ve been slowly trying to get back into the school routine. Actually, not so slow. One day I wasn’t in the school routine and the next day I was. But we’re doing okay! I get up at least an hour before I get the kids up. I use the time to work, eat breakfast, and get a cup of coffee down in the quiet house before the morning hustle begins. It keeps me sane and it helps the morning go so much more smoothly. Since I’ve already eaten breakfast by the time the kids wake up, I can focus on other things while they enjoy their breakfast. So, I run upstairs, wake the kids up, get them dressed and brush their hair. We go downstairs, I throw their breakfast on the table while they put napkins and silverware out. While they eat, I unload the dishwasher or finish up a little social media work if I need to. It would be easy to carve out a measly ten minutes to prep this maple dijon ham and set the slow cooker up to do its thing. Super easy meals like this one aren’t just for moms who have toddlers. I loved meals like this when I was working full-time as a physical therapist. There aren’t many things better than coming home to a house that already smells of a home-cooked dinner. And I can imagine when the kids are older, I’ll still lean on easy slow cooker meals like this one before hustling off to sports games or choir concerts or whatever the kids may be interested in. To prep this ham, you do two things. 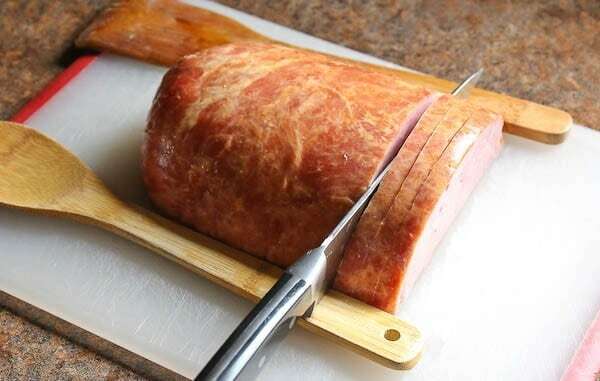 First, line up spoons next to the ham and cut it into slices down to the spoons. If you’ve ever made hasselback potatoes, it’s similar to the method you use to make those. If you happen to slice all the way through the ham, it’s totally fine. But it makes for a pretty presentation to have the ham still intact but sliced. 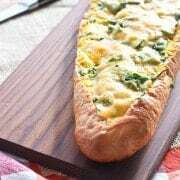 You want to slice it and not leave it whole so that the maple dijon glaze can make contact with every slice, ensuring the flavor is there in every bite. The next thing you do is mix up the 4 ingredient glaze (maple syrup, dijon, brown sugar, cloves), pour it over and set the slow cooker to low. Easy peasy! PS: This is great for entertaining, too! 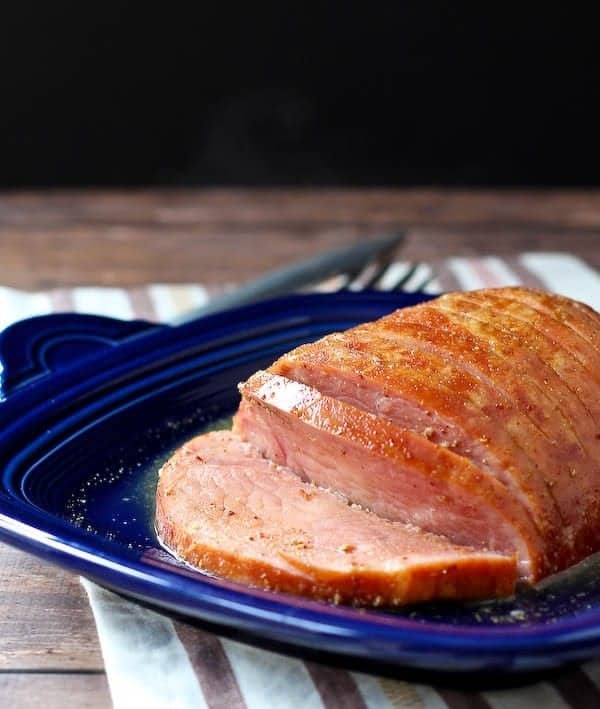 Whether you’re entertaining or just looking for an easy dinner with great leftovers – this maple dijon ham is for you. Bonus: SLOW COOKER. Totally hands-off! Lay ham on cutting board. Place two wooden spoons on either side of it and cut through ham to spoons, making slices that don’t go all the way through. Place ham, sliced side up, in slow cooker. 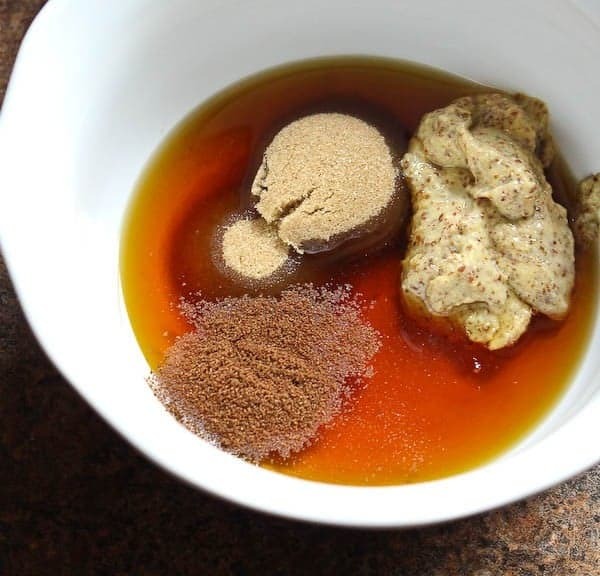 Mix together maple syrup, dijon mustard, brown sugar and cloves in a small bowl. Pour this mixture over ham, trying to get as much between the slices as you can. Cook on low for 4-6 hours or until heated through, basting with sauce (spoon it over the top) every 1-2 hours. Note: Feel free to use a bone-in ham instead of boneless, as long as it will fit in the slow cooker. They have great flavor thanks to the bone, plus you can use the bone to make soup! Verdict: Love this ham! The maple and dijon play perfectly with the salty ham and the touch of cloves is the perfect little twist you need to keep this interesting. Husband’s take: Hates the photos, loves the ham. Ha! He thinks the plate (It’s Feista!) but he thinks it looks like a plastic grocery store tray. Like the kind you buy a rotisserie chicken on. I can’t make this stuff up. Changes I would make: None! No way. Difficulty: FIVE INGREDIENTS. Slow cooker. Pretty dang easy. 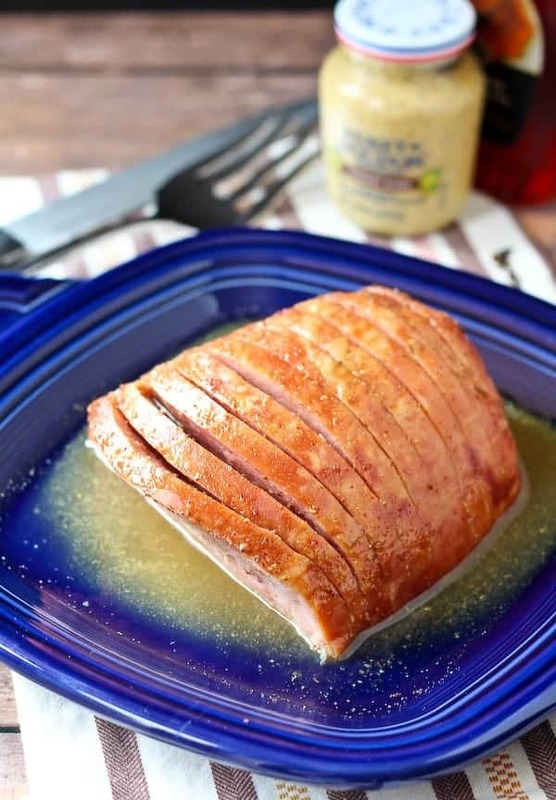 Make sure to check out Ohio Pork for more recipe ideas! If you have questions about farms, pigs, pork and farmers you can also visit their website or Facebook page. Disclosure: This post is sponsored by the Ohio Soybean Council & Ohio Pork Council. Pigs eat a lot of soybeans as part of a quality diet. A quality diet helps make a quality product – pork. And we love pork! 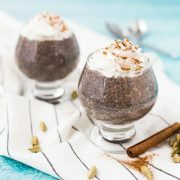 I have been compensated for the time required to develop this recipe and write this post. Thanks for supporting Rachel Cooks by reading about brands, products, and food I love and use in my own kitchen. Can you use a pre sliced ham? This looks amazing! I don’t have a slow cooker, though — is there a way to modify to prepare this in the oven? You could cook it over really low heat in the oven (300 or so) just until it is warmed through. 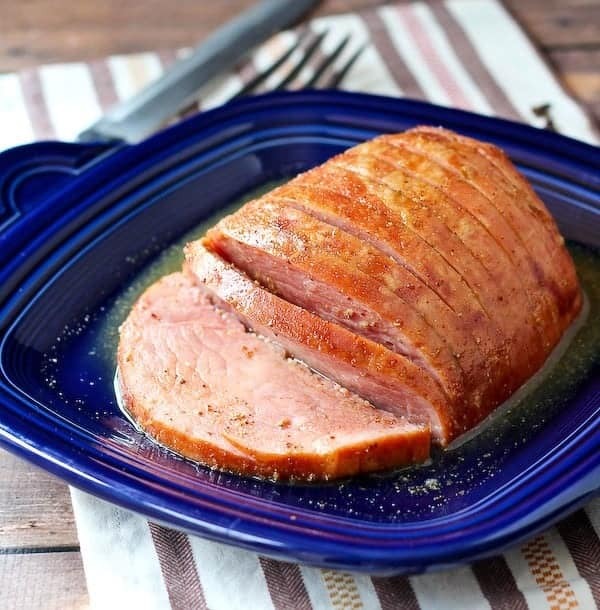 I’ve been searching for new ham recipes for the upcoming holidays and this is perfect! Thank you so much for sharing, Rachel! These pictures are not ugly – your hubs is wrong :) The pork sounds lovely and I love the little tip about lining the ham in between 2 spoons. That makes slicing the ham even easier! Plus that glaze…..so. much. yum! It really is like a hasselback ham – how fun! For some reason, I rarely think to make a ham for a weeknight dinner, but this one is so delicious that I’m going to need to change that! Coming home and knowing dinner is basically cooking itself is the best feeling! That’s for sure. We are BIG ham people in my household….but I had NO idea you could make it in a slow cooker…brilliant! 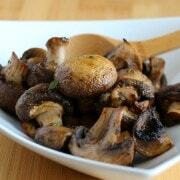 I am all for anything maple dijon, so totally loving this recipe. Pinned! I have 2 giant hams in my freezer I need to use, and now I have just the recipe! Thanks for sharing this! Love the flavors. 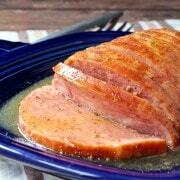 the maple Dijon must add such a nice flavor, also that ham looks delicious, so juicy and tender! i never make ham, but this looks SO good!